Um Computador por Aluno Laptop Auction Begins in Brazil! Yesterday was the first day of the auction process for the Um Computador por Aluno project (One Computer per Student, in Portuguese). The process was suspended at the end of the day inconclusively and can drag for two more days. The lowest offer was at 71.2 million dollars which prices every one of the 150,000 laptops at US$475 which was deemed as unacceptable by the house. Over 8 proposals were made from prices ranging from $500 to $1,600 dollars, but the identity of all bidders will be revealed only after the auction is over. The whole process is being very open, and this was embraced wholeheartedly by the open source community which followed the auction site as if it was a twitter account. All bids and messages from the judges are posted online and can be followed by anyone with an internet access and every half hour updates were posted to multiple OLPC related mailing lists. From there they where dissected as everyone tries to make sense of what, in the end, makes the price of one laptop. And finally all price changes were documented in an online spreadsheet that also converted the prices from Brazilian real to US dollar. The price of US$475 ( R$855 ) include shipping, maintenance and taxes, lots of taxes. In Brazil all electronic imports are charged at least 60% percent over their sales price just to cross the border. Take in account other duties, including sales and that`s the reason this is the leading country in the international iPod currency index. This contradiction, where the government cannot afford to pay its own taxes where previously known and led to some Government officials to declare their intent on making the educational laptop duty-free. Nothing official was arranged before the start of the bid which led the bid judge to clarify that all taxes should be taken in account. The taxes could be lifted later for this or future purchases, bringing the total cost to considerably lower. If OLPC win this game this might mean much more than 150 thousand laptops out of quanta. The UCA project main goal is to achieve a total annual order of 12 million laptops. The process will end in the 20th but government official said the result can be published as late as the 24th. 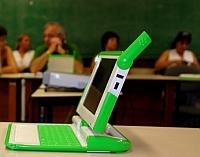 Will OLPC find a 150 thousand present wrapped under it's Christmas tree? Update: Positivo Informática won the first round of the bidding with and offer of the Classmate for 364 US$. The XO got a third place with a price of 386 for each laptop. The second place was for a little known enterprise with a model called CS21 which some supose to be also the classmate. The bidding was not only for the model but for who had the whole infrastructure so multiple companies could compete using the same computer. The process is not finished as the judges complain the final price to be way over the top. Now negotiations are between positivo and the government for some hours. In the end the government can re-open the biddnig process or simply call off the auction as a whole. The next phase will be to test if the models have actually everything that was demanded, such as integrated video conference, open source software with collaboration features buitl in and ad hoc mesh networking. Positivo says they have a new model of the classmate with all those features, but it remains to be seen. I'm a little surprised that the XO's price was $386, given that for only a litle more than that, G1G1 participants were able to procure TWO devices (one of which is donated). I wonder what the cost would be if the government decided that the educational laptops would be duty-free? The rule is that the winner has to deliver two working models within 48 hours for full testing, so I doubt any vaporware was included in this process. To receive my Btest-2 XO earlier this year I had to pay a little over $100 on the declared value of $100, so the OLPC representatives would probably have to deal with a similar markup. And they have to keep all machines working for three years, so if I were them I would set aside an extra 30% to buy replacements. They will probably need a permanent staff of 60 or so people to be able to do everything that is required. Given all that, it seems that Wayan's initial guess of a $900 TCO was a bit pessimistic. So I paid 111.79% on the declared value. If the value is $188 in China it would be $398 in Brazil. So a classmate proposal came in with the low bid? I wish someone would do a price analysis for the components plus production costs for the classmate, as compared with its selling price, so we could see if it is getting a subsidy from Intel. eduardo: The open source community is trying to do a lot of guesswork on those prices. Offcial news are that the Brazilian government had made the laptops duty free, but failed to communicate this to anyone, even the auction judges. Maybe there`s more to this story to come.